The Third Kingsland Irregulars: A foothold. I am loath to write a post that is instigated by something I have seen on the book of face, but I'm going to do it anyway. It illustrates one of the trends that I've been seeing floating around the edges of public opinion lately. This quite comes to me via George Takei's facebook stream (superb btw, the man's come a long way since Sulu). It's not the best quote I've seen illustrating the concept, the general gist of which is that education is more than just preparing another batch of drones who will supply the workforce with labour. It's only floating round the edges, and I think is far from mainstream thought. I get the impression that large numbers of people would read this, agree with it and congratulate themselves for being enlightened. then when the next round of cuts comes to universities and technical institutes, when another round of debt is heaped on students, they will have forgotten the sentiment and be quietly thinking the students should stop complaining and just get on with it. I'll consider it mainstream when the next round of cuts the tertiary sector has to face gathers the same level of opposition as the recent class size debacle. Again this harks back to the University Without Conditions piece that I've linked to several times now. Mass education started out as a means to educate the workforce so that they could work the new machines of the industrial age. 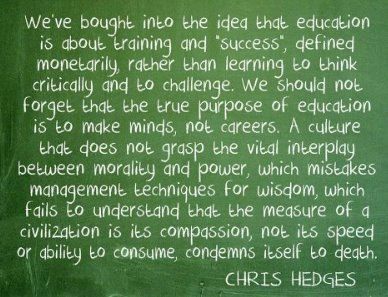 The idea of education to create a citizen rather than a drone was reserved for the sons of the rich. We've come a long way from there, but over the last couple of decades, that's where higher education is heading back to. It's nice to see the idea that education is about more than creating a work force beginning to take hold. One can only hope it continues.